The POINT COMFORT skiffs give one of the best combinations of soft riding, fuel efficiency and potential speed I have ever encountered. It will give a smooth ride in the kind of small chop that would knock your fillings loose in a flat bottomed skiff, and get a big load delivered in good time with a tiny fuel bill. This Point Comfort 23 includes a cuddy with a cozy v-berth, custom upholstery including V-berth cushion and bimini, side and aft seating for a crowd, and a brand new trailer. Weight – Approximately 1800 lb. More information on this design can be found at our Point Comfort 23 page. 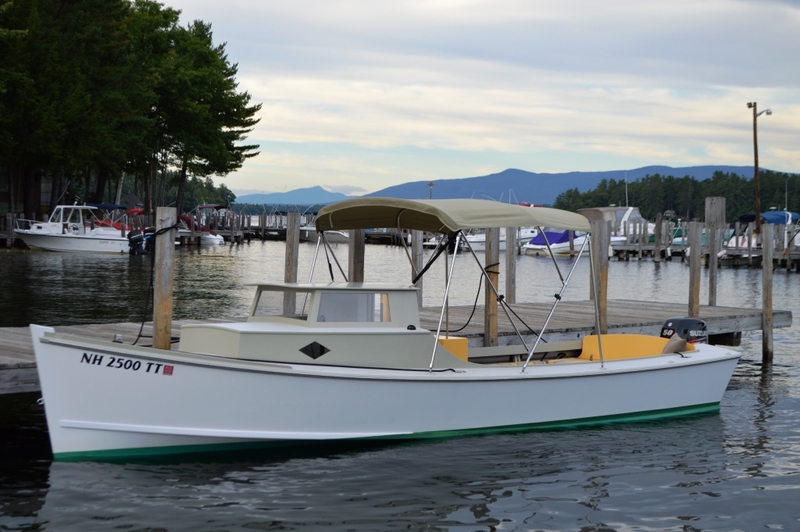 Built in 2016 by Great Cove Boats. Located in New Hampshire.